Fantastic effort by the Cotswold League Team tonight. 1st place with 188points. 2nd Bridgwater 157pts 3rd Norton Radstock 98pts and 4th Dursley with 77 pts. More important than the result was the visible improvement in quality of the swimming by the whole squad. Your starts and turns are looking much better and are making a difference with yet more PBs being set. Thanks again to all the parents and families who came and supported and helped poolside. Without your support we could not run these events. Well done all. 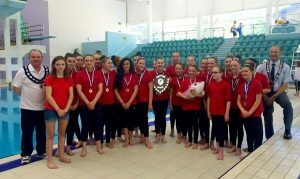 CSWPC Synchro Team won the Walsall Trophy this weekend. The trophy is awarded for the South West Top Club and this is the first time CSWPC have won the trophy. Our Spartans water polo team secured promotion to Division 3 for next seasons British Water Polo League. And our first team won their first British Championship group game.